Today's Barry M Lip Paints swatches consist of some of the prettiest colours in the line. We're looking at berries and reds. They also have kickass pigmentation! No wonder they're called Lip Paints. They're definitely the most pigmented lipsticks I've tried to this date! I know I touched on Vibrant Pink 62 in the previous post, but I thought I'd just swatch it next to Shocking Pink 52 for anyone who wants to know the differences between the two. Shocking Pink 52 is a really eye-burning, show-stopping neon pink, and yes, it's actually a bit brighter and more pigmented than Vibrant Pink 62! Wowza. That's really neon hot pink to the max. If you're looking for that kind of lipstick, your search has ended. It's definitely cool-toned. Punky Pink 145 and Cerise Pink 144 are both pinky plummy berries, and both fo them are my favourites out of the line - they're pigmented and bright, but also very wearable. They kind of remind me of brighter, more pigmented versions of MAC's Sweetie lipstick (which I love). Anyway, they look identical in the swatch, which is odd because in the tubes they looked a little more different. Cerise Pink 144 is a bit brighter than Punky Pink 145, but they're both in the same colour family. Royal Raspberry 141 and Pillar Box Red 121 are must-haves for any girl looking for that red lipstick of confidence. I love Royal Raspberry 141, it's a beautiful cool-toned red. I really like this. Pillar Box Red 121 is a bright tomato red, and this one's for the warm-toned girls. Very beautiful. They kind of remind me of the various red lipsticks MAC has released over the years - Queen's Sin, Port Red...Only these are much more pigmented, and they're cheaper. wow, those colours are extremely pigmented and bright! 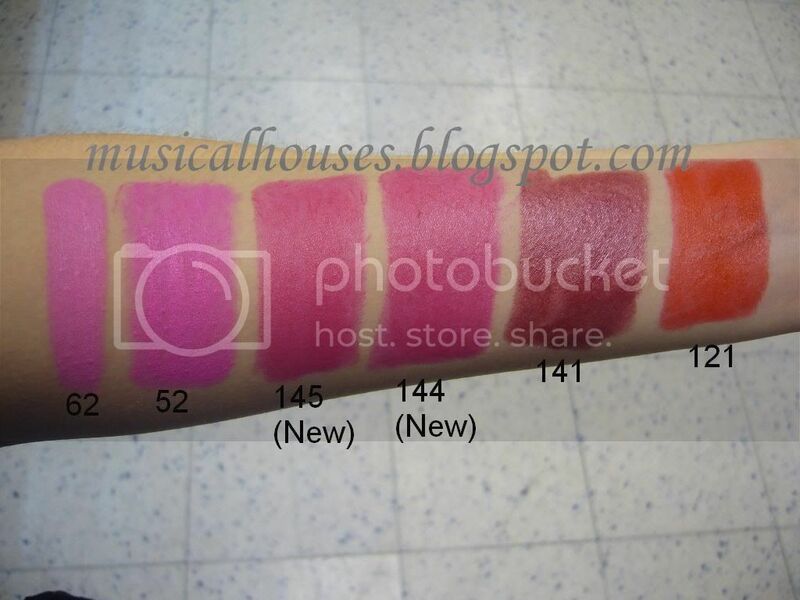 the first four shades look quite similar to me tho. @Theresa: Oops, looks like the photo exceeded its bandwidth! It should work again tomorrow, when bandwidth is restored. If it's still not working tomorrow, let me know, and I'll see what I can do.